When the blueberries start to ripen on our bushes, the boys get excited and eagerly eat the fresh berries as we bring them inside. Occasionally I’m able to set some aside for cooking projects, but most of the time I have competition for their juicy goodness. This time I was able to whip up some easy blueberry butter, which the boys and Michael have enjoyed on toast and English muffins. I created this small-batch recipe for those times that I only have a little fruit and just want a jar or two, and it makes a nice little hostess gift. I use one cup of sugar with our berries and add a bit of cinnamon and lemon juice to round out the flavor. It’s easy to make and doesn’t require processing, just keep it in the refrigerator for up to three weeks, or freeze it. This recipe is for Grow Your Own, a blogging event that celebrates the dishes we create from foods we’ve grown, raised, foraged, or hunted ourselves. I’m a bit late with the announcement for this month, but I hope you’ll be able to join us, just send your post information to me at andreasrecipesgyo AT gmail DOT com by July 31. If you are new to the event, you can read more about the rules for participating at the Grow Your Own page. 1. In the sauce pan, toss the blueberries with the lemon juice. Bring to a boil, then reduce heat and simmer about 5 minutes. 2. 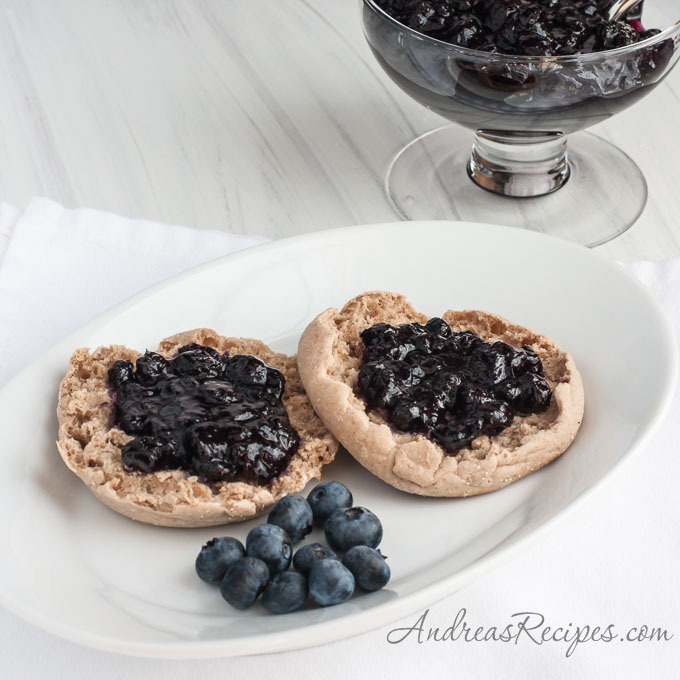 Blend the blueberries with an immersion blender or in a jar blender until very smooth. 3. Return the pureed blueberries to the sauce pan and add the sugar and cinnamon. Bring to a boil, then reduce the heat to low and simmer uncovered until the mixture is thick, about 25 minutes, stirring frequently. 4. Remove from heat and cool completely and store in a jar in the refrigerator or freezer. Will keep for up to 3 weeks in the refrigerator and 3 to 4 months in the freezer. So I’m curious, what makes this a butter not a jam? I made blueberry butter last year, mashing berries with butter: not pretty and not even tasty. Hi Alanna. A fruit butter is different from a jam in that it is cooked down (reduced) to create the thick rich consistency rather than using pectin. Apple butter is a more famous example. This is just delicious!! Thank you for sharing with us!